Oxygen takes the reader on an enthralling journey, as gripping as a thriller, as it unravels the unexpected ways in which oxygen spurred the evolution of life and death. The book explains far more than the size of ancient insects: it shows how oxygen underpins the origin of biological complexity, the birth of photosynthesis, the sudden evolution of animals, the need for two sexes, the accelerated ageing of cloned animals like Dolly the sheep, and the surprisingly long lives of bats and birds. Drawing on this grand evolutionary canvas, Oxygen offers fresh perspectives on our own lives and deaths, explaining modern killer diseases, why we age, and what we can do about it. Advancing revelatory new ideas, following chains of evidence, the book ranges through many disciplines, from environmental sciences to molecular medicine. The result is a captivating vision of contemporary science and a humane synthesis of our place in nature. This remarkable book will redefine the way we think about the world. 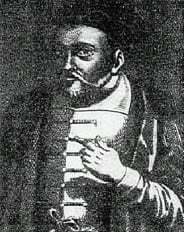 Michael Sendivogius, the Polish alchemist who may have ‘discovered’ oxygen in 1601, 170 years before Scheele and Priestley, by warming nitre (saltpetre). He thought of the gas given off as ‘the elixir of life’. 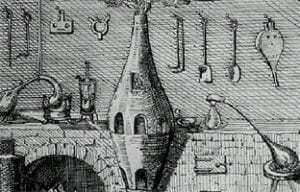 Cornelius Drebbel, a Dutch alchemist and inventor, was a protege of Michael Sendivogius, and inventor to the court of James I of Britain. 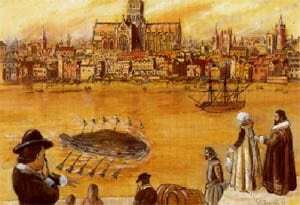 In 1621, his submarine, the world’s first, made an underwater voyage down the Thames from Westminster to Greenwich, a distance of 10 miles, watched by the King and thousands of his subjects. Drebbel apparently ‘refreshed’ the air by removing the lid from a barrel of ‘liquor’ or gas, presumably oxygen — made by warming nitre as Sendivogius had done. Cornelius Drebbel is usually pictured with a voluptuous maiden-student, invariably in a state of semi-deshabile — not the kind of tutorial that would be approved of in today’s educational ethos. 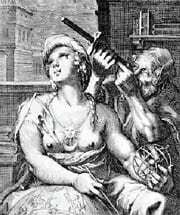 But then he was an alchemist — and judging from the sun and moon necklace, which is full of alchemical symbolism, we’re not supposed to take the image literally. No doubt she’s just a metaphor. And they wonder why the alchemists got a bad name. 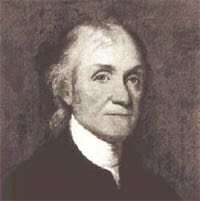 Joseph Priestley, looking a bit glum. He was a political radical as well as a great chemist, who ended his days in the land of the free — America — which treated him better than England ever did. But the quest for knowlege seems to have lost some of its fun since Drebbel’s day. 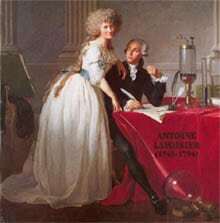 Meanwhile, over in Paris, here is Antoine Lavoisier, often rightly called the ‘father of modern chemistry’, with his remarkable wife Marie Anne. Years later, after Lavoisier had lost his head to the guillotine in the French Revolution, Marie re-married, to Count Rumford, another chemist. She later threw him out after a furious domestic quarrel with the warning never to return. 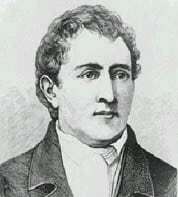 Carl Scheele, who is credited, correctly, by the Swedes, for the discovery of oxygen in 1771 (if we don’t cede precedence to Sendivogius). He was certainly a couple of years ahead of Priestley, but failed to publish his results after relying too heavily on aristocratic patronage. He also wrote to Lavoisier – a letter Lavoisier maintained he never received (and it’s possible the letter was hidden by Marie for reasons best known to herself). Scheele’s spartan laboratory and workshop, in which he discovered seven new elements (including oxygen) as well as other new compounds such as glycerol, hydrogen sulphide and citric acid. Highly ambitious.... 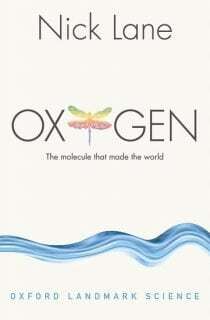 Oxygen is a piece of radical scientific polemic, nothing less than a total rethink of how life evolved between about 3.5 billion and 543 million years ago, and how that relates to the diseases we suffer from today.... This is science writing at its best. Enthralling.... An excellent book. It held me spellbound for a 7 hour plane flight. I recommend it unreservedly."
. . . a breathtaking, broad vision of the role of a single gas in our life, from the origin of organisms, through the emergence of creatures, and to their deaths . . . packed full of interesting life-and-death stories...A wonderful read. Nick Lane's chapters are dispatches from the frontiers of research into Earth and life history, but they contain nothing that will lose the patient reader and much that will reward.